After a century of speculation and a half-century of searching, science teams using instruments built by Caltech and MIT have made a discovery that will take up permanent residency in physics textbooks from now to the end of textbooks. They've found the gravity waves that Einstein's General Theory of Relativity predicted must pervade the cosmos. I often get correspondence from folks who think that listening for radio signals or looking for laser flashes are fundamentally flawed approaches to hunting down evidence for alien beings. The extraterrestrials, these people suggest, will have moved on to a more avant-garde communication mode: gravity waves. There are, indeed, some positive arguments for aliens with a penchant for palaver to opt for gravity wave communication. 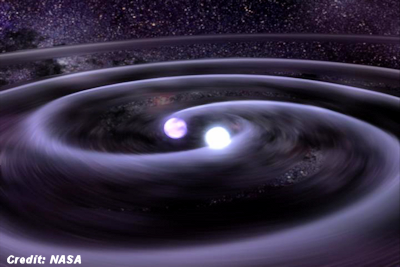 Gravity waves can travel unhindered through the dusty material that suffuses interstellar space -- unlike laser light. And gravity waves aren't distorted and scattered by the ionized gas that clutters the cosmos -- unlike radio waves. Amazing New Discovery in The Universe!